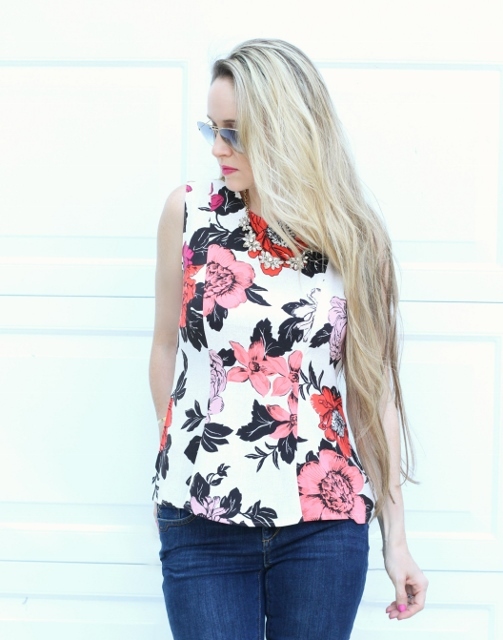 Today’s look features this bright, floral peplum top that’s been on heavy rotation these past several Summer weekends. It’s the perfect piece to either dress up with a slimming pencil skirt or to dress down with trousers or skinny jeans. It’s true that I am fairly over-dressed most days of the week by preference – you will usually find me in skirts, blouses, and dresses about 95% of the time – but on days where I’m just out and about running errands or enjoying more semi-casual events with friends or family, a pretty peplum top and a well-fitting pair of dark, skinny jeans is my combo of choice. 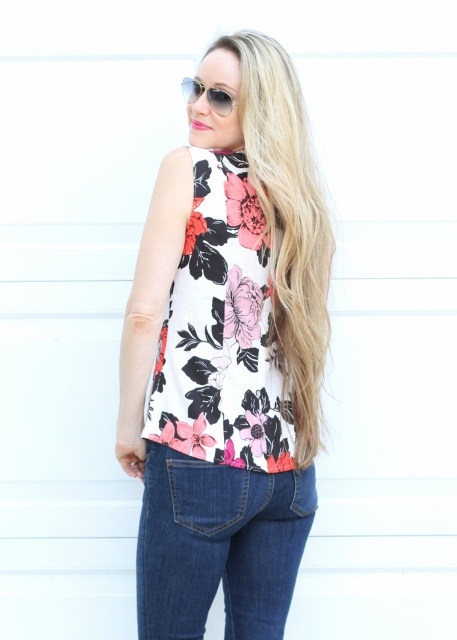 The print in this top is so eye-catching and ideal for either Spring or Summer. The bright, poppy-red and mauve-pink colors of the flowers contrast perfectly with the classic black of the interwoven leaves and the overall creamy, linen background color. The print pairs nicely with red, coral, mauve or blush, cream, and a host of other complimentary colors, making it highly versatile. And, if you adore the print as much as I do, you’ll be happy to know that it’s also available in a fit-and-flare dress, pencil skirt, and shorts – all of which can either be paired together or separately for endless mix-and-match combos! 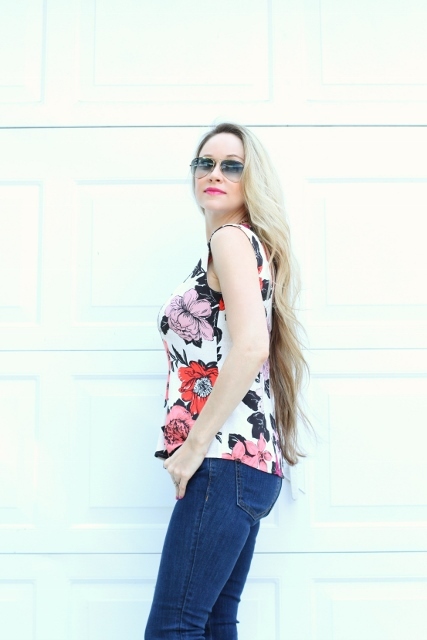 This top is not only beautiful, but extremely comfortable and flattering; just throw it on and go! I’m wearing size XSP for reference, and the fit is a little more on the blousy side, but that doesn’t deter from the overall look, in my opinion. I highly recommend it! 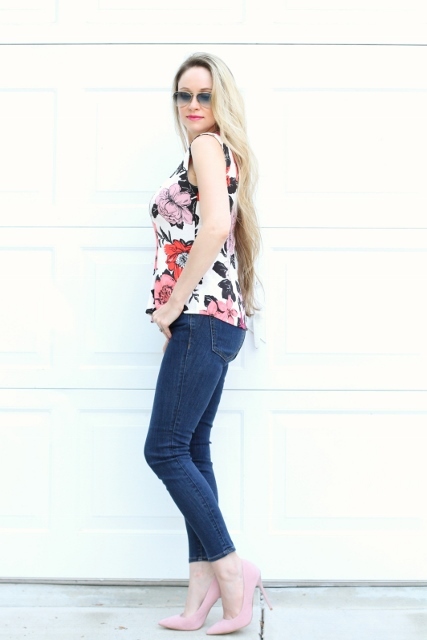 To counter the slightly flowy silhouette of the peplum top, I paired it with dark, skinny ankle jeans. I find that this combo keeps the overall look more streamlined and balanced in terms of fit. The dark wash is extremely slimming and flattering, and perfect for a more dressy-casual look. Plus, the ankle-fit elongates my legs and creates the illusion of height on my petite frame (and I’ll take any help I can get in that area, haha!) I sized up for a more comfortable fit, and am wearing size 25P for reference. The petite sizing works perfectly for me with its 26” inseam, and hits me right at the ankle as it should. To pull everything together, I added a sparkly, crystal statement necklace and pink, suede pumps; it keeps the look slightly more dressy and feminine. As always, thanks for reading, and have a lovely evening!